Stage fright is one of the biggest fears that Americans face today. We may be the most charming, talented person in the room; but when placed in front of a large audience, our fear soon takes over and overwhelms our ability to convey our personal charm and talents. While it may seem like a small problem, stage fright is actually a rather serious condition! When experiencing stage fright, the body literally paralyzes due to the overwhelming sensation of fear – our minds go blank, our throat tightens up and we literally freeze in place, unable to move. Do you find yourself unable to let your true personality shine when performing in front of an audience? Are you tired of messing up your performances because of your fear? Have you always wanted to turn into the superstar performer that you’ve always dreamed you’d be? Have you often wished to become a comfortable, confident performer that can effortlessly charm over your viewing audience? 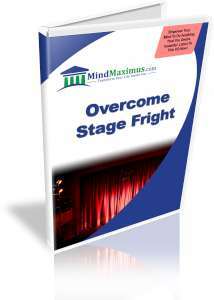 While stage fright is a very common fear, it is by no means a natural one. In other words, stage fright is a fear that people develop as they grew up. It’s a learned fear. And that’s great news because with today’s advanced Brainwave technology, we are now able to isolate and effectively eliminate this fear with no side effects at all! No reviews on B11 Overcome Stage Fright so far.